Kelly Pope is a Workers Party member in Christchurch who took part in the February protest for democracy in Christchurch. On our website we’ve already published a smaller article about the protest which was also written by Kelly. One of the largest protests Christchurch has seen in the past decade took place on February 1 in response to lack of democracy and transparency within the Christchurch City Council. News sources estimate that up to 4000 people attended the midday demonstration held at the site next to the council offices where the St Elmo Courts building stood prior to earthquake damage and demolition. Protest organisers arranged for music to be played from the temporary stage and speaker set-up from 10am, and many people arrived early, having lunch in the empty lot. When the protest got underway, people expressed their outrage, calling for the resignation of Mayor Bob Parker and council CEO Tony Marryatt as well as Autumn elections to select new council representatives. From the middle of the space where people gathered it was impossible to tell how far back the crowd stretched in any direction. A large number of people held banners and signs and the frustration was audible as people chanted and cheered. The catalyst for this major display of public discontent was the City Council’s recent decision to award its Chief Executive Tony Marryatt a 14% pay rise, bringing his salary to $538,529 per year. Seeking advice on how to remunerate Marryatt, the council was advised of a range of options from no increase in pay to the highest increase of $68,000 – the figure which they agreed to award him with back pay from June 2011. When criticised, the council defended its decision highlighting their policy to align executive salaries with the general market pay rate. When the private sector is excluded, however, Marryatt’s new pay rate amounted to over $100,000 more than the average salary for similar public sector roles. The anger of Christchurch residents over Marryatt’s pay was amplified by the CEO’s absence at the time of its announcement as he was on holiday on the Gold Coast. When another aftershock effected Christchurch, Marryatt remained overseas as other local and national politicians returned to the city to show their commitment and support. The public questioned whether Marryatt cared about the people of Christchurch as much as the money he made in his council role. Following a smaller demonstration before Christmas, a group of people including protest organiser Peter Lynch began publicising a further demonstration to be held on the first of February. Advertisements were taken out in major Christchurch newspapers, thousands of posters and leaflets went up around the city and were delivered to residents’ letterboxes. Marryatt’s pay rise and the protest in opposition to it became a main focus in the media. Around the city people could also be overheard talking about their disagreement with the pay rise, asking others if they’d be going to the protest, and large numbers of people joined the Facebook event page for the demonstration. While the council had initially seemed ambivalent towards the planned public action, as the date of the protest drew closer and people became more vocal in their support for the event, Tony Marryatt and Bob Parker’s opinions regarding the pay increase shifted dramatically. 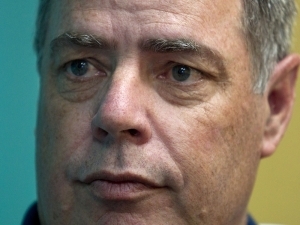 Marryatt’s original defence for the decision to accept the pay increase was that he had never worked so hard in his life until after the February 2011 earthquake. However, due to public pressure Marryatt decided to decline the raise and Bob Parker stated the need to act according to what the public wanted. Prior to this change of heart, Parker had strongly pushed the council to accept the significant pay rise for the council CEO. Where there had been disagreement on the issue, Parker publicly suggested that, should the council be unable to come to an agreement on the pay rise, the national government may need to step in to replace the council with some other governance body. This appeal for government intervention was unexpected considering the struggles of other local government groups in recent years against interference. 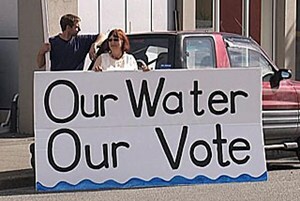 In 2010 the government’s replacement of the democratically elected regional councillors in Environment Canterbury (ECan) with commissioners led to large protests in Christchurch as people expressed dismay at the erosion of local democracy. More recently the earthquake response at the national government level has also become a subject of criticism for the way it has undermined democracy. The transfer of decision making power away from elected councillors contributed to a sense of disempowerment for many Christchurch residents as government appointed organisations including the Canterbury Earthquake Recovery Authority (CERA) and individuals such as Earthquake Recovery Minister Gerry Brownlee were given disproportionate influence on decisions in the Canterbury region. A further surprise for Christchurch residents was the assertion by local government minister Nick Smith that he would not get involved in the governance of Christchurch through overriding council decisions. 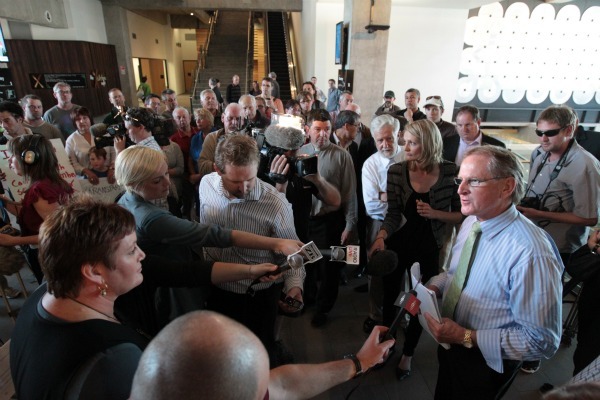 Issues for the City Council would need to be resolved within and by the council. Though Parker may have expected otherwise, his eventual acceptance of what the public wanted was not met with revived support but further anger. Adding to this, the fact that Marryatt had declined repaying what he had already received in back pay, around $34,000, became the focus of public and media attention. Marryatt’s reason for refusing to repay his raise from June 2011 to January 2012 was his desire to see the council working together better. An Official Information Act request not long before the February protest enabled the media to report on Marryatt’s competence through publishing the details of his performance reviews as CEO. Contrary to Bob Parker’s initial statement, that Christchurch needed to be prepared to pay for the best if we wanted the best, the reviews did not positively reflect on Marryatt in his role. Over the previous three years Marryatt’s rating out of five dropped from 4.3 to 3.9 in 2011. The performance review highlighted Marryatt’s strengths, namely his clear vision for the organisation and his leadership of the senior management team. Areas for improvement included early identification and management of “potentially sensitive or contentious” issues. This was an unsurprising discovery for people against Marryatt’s salary increase. On the day, thousands of people showed up to voice their discontent. The atmosphere at the demonstration was intense, the people were angry but a sense of achievement existed amongst those present. For many it was the first time they had demonstrated or taken political action on an issue. When speakers mentioned the names of councillors who had voted in favour of the pay rise, their words were drowned out by the crowds chanting of “Out! Out! Out!” and the end of each speech was met with cheering and applause. A variety of people spoke, the most memorable being a fire fighter who had worked in the CBD on the day of the February earthquake. He too had worked harder than he ever had in his life, but earned a tiny income compared to that of the council CEO. This theme of income inequality came across strongly in the speeches, the presence of Occupy protesters, and the signage people carried which highlighted issues from poverty in Christchurch to the flaws of trickle-down economics. While this focus was evident, the suggestion by the protest organisers to engage in rates revolts overlooked the housing situation in Christchurch where many people cannot afford to own their own homes. There were also some mixed messages in the speeches on the day. 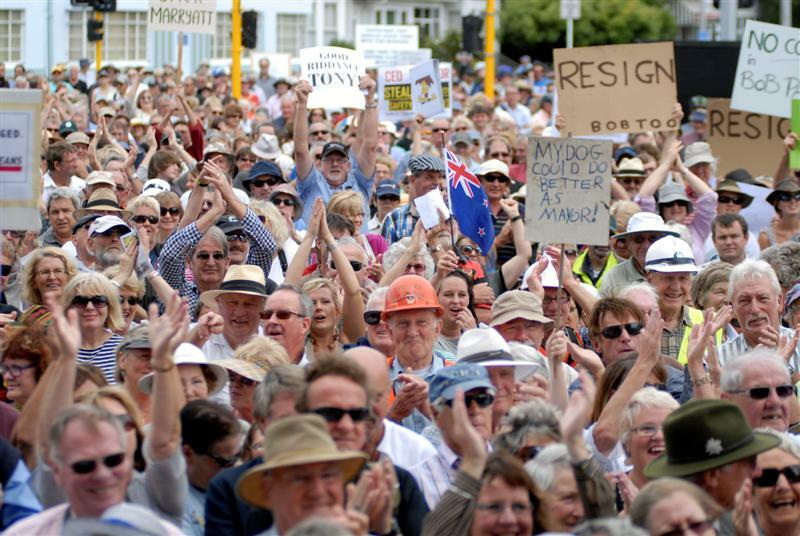 People called for greater democracy at a local level at the same time as telling John Key to recognise his own interest in the issue and instigate government intervention. Despite these issues, people in Christchurch have seen what can be accomplished through collective action. We need to keep escalating the demand for local democracy in Christchurch and fight back against any and all attempts to further turn the council into a business management model. Whilst Marryat is not an elected representative (and in our view councils should be run only by elected representatives, not by CEOs and consultants) we also take the opportunity from this saga to emphasize our position that elected representatives should not receive high salaries but should only take the average wage of a skilled worker and donate the rest back in to the movement. This is a way in which our party is in sharp contrast to other parties – any candidate we stand for election upholds that principle. And the reason for that is because we are involved in politics to fight for the working class, not to feather our own nests at the expense of workers and ordinary people.